Phil Pickin meets the team at the Bickerstaffe Boat Company. On the water at Lydiate, home of the Mersey Boat Club. 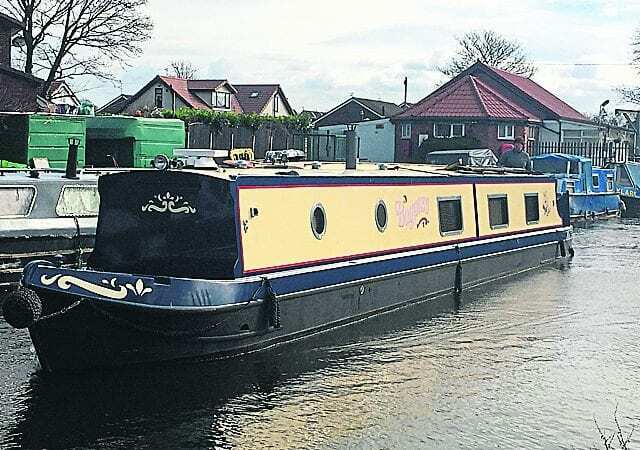 PEOPLE come to boating in some unusual ways and none more unorthodox than husband and wife team Kevin and Susan Kenny who, after spending more than 25 years in the automotive industry, packed it all in to build narrowboats. A domestic four-burner cooker is good-sized fridge-freezer all sitting beneath block style worktops. Boat owners already, they didn’t need a lot of persuading what direction to take when their highly successful vehicle repair and servicing business got to such a size that they spent more time dealing with the day-to-day stresses of managing the business than actually running it. Some might say this is a nice position to be in but for Kevin and Susan it just highlighted the stress they were both dealing with, so around three years ago they decided to slowly wind down the garage business. 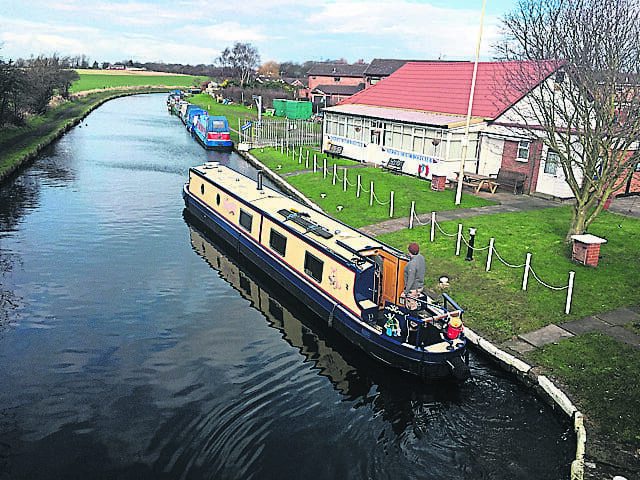 They did this while building and developing their narrowboat-building future using their existing premises to build a range of ‘off the peg’ narrowboats. Over the ensuing months they, and their build partner Robert Pinto, spent many hours on their prototype boat conducting research – nice work if you can get it! The thinking behind this was to come up with a design that would be both innovative and cost effective both to build and to own. Much of this work was carried out at Lydiate on the Leeds & Liverpool Canal, home of the Mersey Motor Boat Club. The result was not only a very well-priced and well-spec’d boat but also a unique way of doing business. From the outset they decided to do away with build slots and only sell what they had and for there only to be 10 boats built per year. With these points in mind they embarked on building 57ft cruiser-styled boats fitted with what they feel to be the best quality fittings and finish they can provide for about £85,000. No deposits are taken and there are virtually no options as Kevin feels they have thought of just about everything. When they are completed they are sold via Apollo Duck and the Sales Pontoon and given the speed the first few have sold it would seem that they might be on to something. As Kevin said: “The resale market for almost-new boats is very good and customers don’t have a choice when buying those.” So with their price point set to around the cost of a good-quality young boat they feel customers can get a new, high-spec boat for the same price. Although unorthodox the approach would seem to be working as the first few boats have been sold, including one to a couple from New Zealand! The stainless look has been featured in the choice of materials used. So what do you get for your £85,000? Well, it’s hoped that with all of the development work having been carried out on Kevin’s prototype boat Bagpuss you will get an attractive and well laid out boat, judging by the ones seen in the workshop. All of the boats use Aintree Boat hulls and have been fitted out with oak finishes and trim. These work well with the pastel coloured V-groove ceiling and bottom boards. The result is a bright interior which is helped by concealed LED lighting and lights within all the cupboards that activate as you open and close the doors. 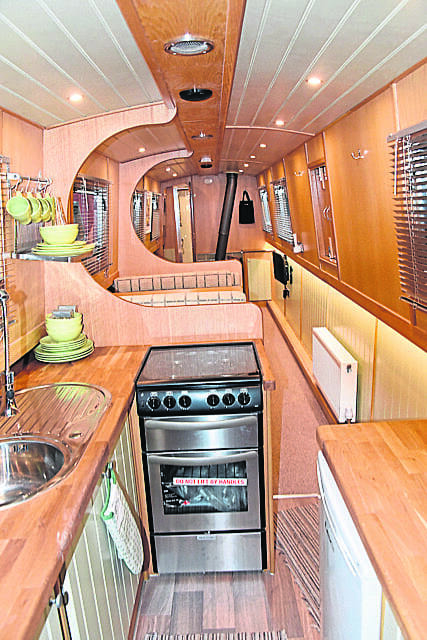 All of the interiors are hand built, as are the worktops and trim detailing in the galley area and which are all solid oak. All of the boats are four berth with a fixed double forward and a dinette which converts to another double if required. This, together with the fixed L-shaped seating area, provides plenty of accommodation for those on board. Heating is provided by a wet system as well as a Morso stove which provides a nice focal point to the main living area. 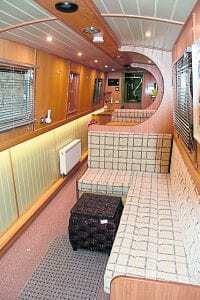 A TV screen is wall mounted and speakers are fitted within the roof panels throughout the boat. In the walk-through galley there is plenty of storage space and the stylish double drainer sink with its pull-out tap takes up a good proportion of one side of the worktop. A domestic four-burner cooker is fitted, as is a good-sized fridge-freezer all sitting beneath block style worktops. Handy stainless steel crockery racks have been included on the walls and the stainless look has been featured in the choice of materials used in the blinds fitted to each window. In the bathroom there is a large quadrant shower cubicle which should make using this facility easy and comfortable. The room has a walk-through layout with a wash basin opposite the shower and a somewhat unconventional location for the cassette toilet. 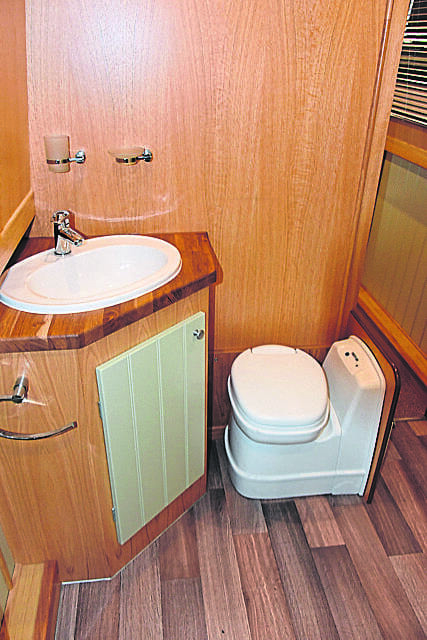 It utilises the toilet’s swivel function to sit beside the wash basin and take up as little room as possible. Handy storage lockers have been fitted, making maximum use of all available space. Finally there is a cosy double room at the bow. Full-length wardrobes are a handy feature and good-sized overhead lockers once again make full use of all the space on offer. Double doors lead out on to the well deck and the bed has been fitted with a very substantial mattress. As with all of the rooms on the boat, all the mains sockets offer USB charging facilities, evidence of the thought that has gone into the design of this range of boats. Power is provided by Vetus 42 HP engine PRM hydraulic gearbox with Vetus supplying much of the equipment used on the boats. With Exide providing the batteries and Webasto supplying the heating system, Kevin and Robert have opted for well-known and trusted brands which, they envisage, will provide them and their customers with as few problems as possible. All of the boats are independently inspected at all stages of the build and they adhere to the Recreational Craft Directive. The fixed L-shaped seating area. Having looked over one of the boats and seen a number under construction it seems that the team at Bickerstaffe are offering potential boat owners plenty of food for thought. Given the amount of consideration that has gone into the design and layout, mixed with the equally good track record of the supply chain, the boats should prove to be really good value for money. With a number of interesting developments due this year it will be equally interesting to see if this new way of offering boats will continue to be as popular as initial indications seem to show. Heating: Webasto central heating and Calorifier. Morso Squirrel stove. Chrome heated towel rail in washroom. Media: Kitchen CD-DVD player. 12v-240v TVs in lounge and bedroom. Galley: 12v fridge freezer – four-burner hob, oven and grill. Worktops in solid oak. Pull-out tap on sink. Lighting: 12v LED plus in-cupboard lighting. Dinette: Pullman style which converts into second double bed. Washroom: Quadrant walk-in shower; Thetford cassette toilet; ceramic wash basin. 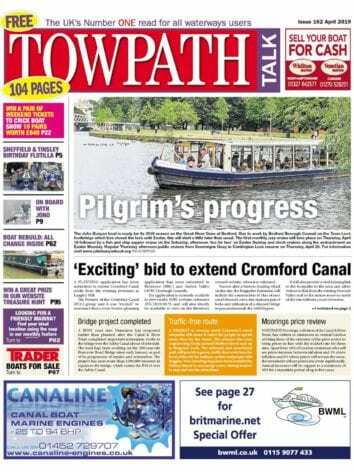 Next Post:April Towpath Talk out now!